Last month’s “Who Dat?” feature left a lot to be desired. For some time now, we’ve been offering photos of unknown buttons, arranged alphabetically by candidate names, for you to help identify. But last month focused on candidates whose last name began with an “I” — and there were only a handful to illustrate. We’re back on track this time. We appreciate your help. As you know, every so often we come across campaign buttons for candidates we’ve never heard of. How do we identify who they are? And when we see a “Smith for Congress” or a “Jones for Senator” button, well, how do we know which Smith or which Jones? That’s where you come in. Thanks for all your help; you’ve been doing an amazing job, and we are most appreciative. (Check out our previous “Who Dats”: Unknowns beginning with the Letter A, Letter B, two pages for Letter C (here and here), Letter D, Letter E, Letter F, Letter G, Letter H and Letter I. Row 1 — All we know is the “Jake in ’68” is definitely not Jacob Javits of N.Y.. Myles Joyce could be from Somerville, Mass. Row 2 — “Stan Jones/Democrat for Representative” could be from Indiana. Row 3 — John H. Jones picture button is from Chicago, turn of the century. Row 4 — Allison James is North Carolina 1936, lost Dem primary in 5th District. Blurry button #3 reads “Elect Johnson Whitehead Campbell/May 12th.” Blurry button #4, “H.L. Johnson for county treasurer,” is from Reading, Pa. in 1905. Row 5 — Flasher reads, “Tom Jackson/State Senator/26th District.” The collector we got the “Let’s Back Jack” button from says it’s for Jack Gilligan of Ohio, but we remain skeptical. Gilligan’s last run for office was his unsuccessful gov. re-election campaign in 1974. This button is clearly more recent than that. He was also elected to the Cincinnati Board of Election in 1999, but it’s hard to make the case this button is from that campaign. Row 6 — The “Any Friend of Jennifer” button may not be political. John Januszewski ran unsuccessfully for mayor of Bayonne, N.J. in 1962. Ted Jensen lost his bid for re-election in Jenkintown, Pa., in 1989. Haley Leads The Way On The Flag; Which GOP Candidates Will Follow? Row 4: Jones for Governor is Sam Jones (D-LA), but don’t know if it is from his winning 1940 or losing 1948 runs. In the second row, the “Joe Democrat for Mayor” is Joe Keran, who was elected mayor of South Bend, Indiana, in 1987. Joe was re-elected in 1991 and 1995. In 1996, kernan was elected Lieutenant Governor of Indiana. He became governor in 2003 when Governor Frank O’Bannon died in office. Kernan was defeated for a term of his own in 2004. Andrew Jakomas was elected mayor of McKeesport, PA in 1953, 1957, and 1961, and lost the Democratic primary in 1965. 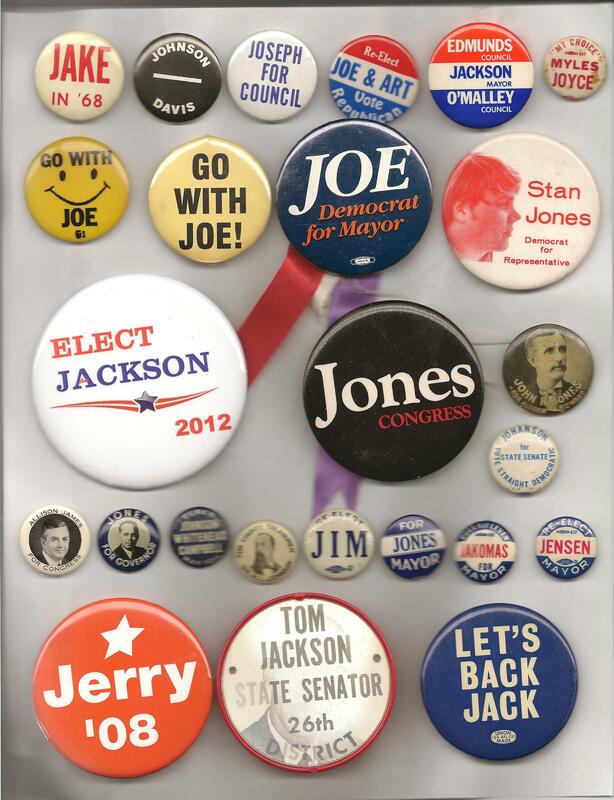 Ron G is correct abt the San Jones of Louisiana pin the Let’s Back Jack white on blue pin is likely Dem Jack Reardon…longtime Kansas City, KS mayor who ran for Congress in ’84 against Jan Meyers.